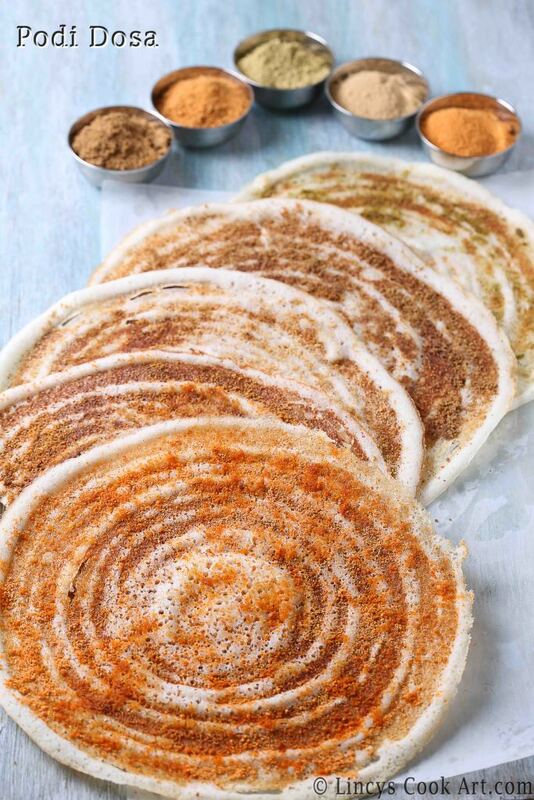 Chana Idli podi Dosa, Curry-leaves podi Dosa, Ellu podi Dosa, Flaxseeds podi Dosa, Kollu podi Dosa : Chutney powder dosa or Podi dosa is an absolute delight and an simple spicy dosa prepared with any idli podi of your choice. I have made this dish with 5 types of podi using the basic Chana Idli podi, Curry leaves powder, Ellu podi, Flaxseeds podi and the Kollu podi. You could make using any desired podi of your choice. You could add some onion or vegetable or even make egg dosa and sprinkle these podis of choice on top. I have shared many Dosa Recipes in blog. Do check my basic Idli Dosa batter recipe. 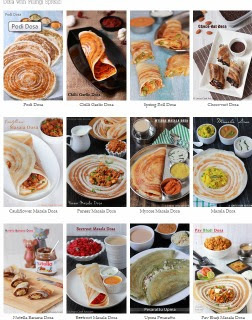 Dosa with different fillings such as Mysore Masala Dosa, Masala Dosa, Beetroot Masala Dosa, Broccoli Masala Dosa, Pav Bhaji Dosa, Paneer Masala Dosa, Mushroom Masala Dosa, Chicken Masala Dosa, Nutella Banana Dosa, Palak Paneer Dosa, Choco-Nut Dosa, Spring Roll Dosa and Vegetable Egg Dosa are shared in the preceding links. The plain dosa recipes are as follows Curry leaves Dosa, Spinach Dosa, Beetroot dosa, Pumpkin Dosa, Tomato Dosa,Cucumber dosa, Onion rava dosa, Neer Dosa, Soyabean dosa, and Tricolour dosa. Heat the dosa tawa and grease the pan with little oil and spread the dosa in concentric circles. You could make uttapam and follow the same procedure. Spread the podi of choice evenly over the dosa using hand. You could add some chopped onion or veggies of your choice or even egg and sprinkle the podi on top of it. Drizzle little oil and allow to cook till the dosa becomes crisp and golden. This dosa does not require any side dish ,but you could serve with chutney or sambar of your choice.